ESD and Surge protection over each individual USB 3.1 port. An industrial-grade USB 3.1 Mini 4 Port Hub that gives you up to 5Gbps of data transfer speed and a surface mount capability. Includes and 5V DC input jack for self-power option. USB 3.1 powered hub with industrial-grade chassis and surface mounting flanges. The CG-U3MINI4PH is a 5V DC input, generation 1 USB 3.1 hub with ESD and Surge protection. 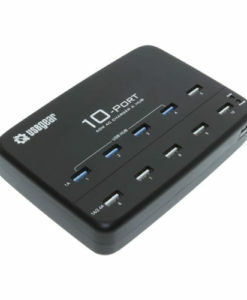 This USB 3.1 Hub will support fast charging for Apple 1A/2.4A and Samsung Galaxy devices. Each port is protected individually to help keep your peripherals safe. The USB 3.1 Hub uses a GL 3510 chip, each port is on an individual circuit to maintain high current and protection. The GL3510 Hub controller chip features native fast-charging and complies with USB-IF battery charging specification rev1.2. A perfect little hub for my application.